Over the last few weeks myself and the boys - well mainly me have been trying out the HP Slate its an all in one PC that is one of the first of its kind I am going to tell you about the technical side of it first then I will tell you my thoughts on it. The HP Slate 21 looks just like a desktop, with its 21-inch, 1080p IPS panel touchscreen, you can use a keyboard and mouse if you want to, but it’s ultimately designed to work as a touchscreen so you won’t get the same level of productivity you’re used to with a standard desktop as it doesn't have the same shortcuts.The HP slate runs on Android 4.2.2 Jelly Bean. There’s a lots of ports on the rear, including power, two USB sockets and an Ethernet connection. On the side you’ll find the SD card slot, headphone jack and another USB port. There is a front-facing 720p camera is ideal for video chats and Skype calls, while underneath is a wide speaker grill which gives off surprisingly decent DTS sound. The Slate is powered by a speedy Nvidia Tegra 4 quad-core processor, which means browsing through Android is a snap and games will run very well. The screen is so big and brilliantly bright, with fantastic viewing angles, plus you can tilt it at various angles you want too, using the stand.Meaning it is easy to use while standing on a table top or as a smart TV viewed flat from the other side of the room. Let me tell you how I have found it, well when I first took it out of the box I couldn't believe the size of it its huge and actually quite heavy, I am not very technical when it comes to electronic goods but it was very easy to work out how to switch it on and where the ports were for the keyboard and mouse, it was also easy to find the button to turn it on I thought the "battery" had no charge given its a touch screen and like an over sized tablet, I plugged it in at the mains for about an hour and then unplugged it as it was trailing across the living room, what I didn't realise it has no battery so to use it, you have to leave it plugged in at the mains, you have to remember It’s really not a laptop or portable tablet so there’s no battery – instead it runs off the mains. I really wish it did have a battery because moving it around and finding somewhere to plug it in can be tricky. The apps are really easy to download and once downloaded of course like any other tablet or mobile device you can have access to all your favourite things such as Facebook, twitter BBC iplayer which is great but somehow because its so big it didn't quite feel very natural I mean for instance Facebook and twitter they run fine but seeing them elongated across the screen just looked odd using the device, because I think its so big. However if you love the iplayer or netflix things like that this is perfect for. I don't have a TV in my room, this was great for standing at the end of my bed and watching a film after hours or catching up with programs I had missed. If you have children there is plenty of room for them both to play games on it without huge arguments and fighting, it would be great downloading educational apps and for planning on with the calender you could use it for family events, appointments and outings. The HP TrueVision HD Webcam is quite low quality compared with what you might be used to on your phone, but for a low cost device I think it is pretty average. In bright light, it works well, but in low light it’s poor, struggling to keep up with even the slightest movement. Again as long as you’re in good light. I can imagine this would be great if you have skype - I don't but if you use it regularly to talk to family the huge screen would make it a great experience. 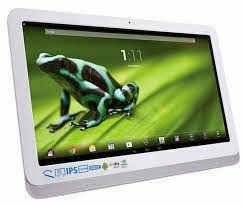 I have really enjoyed using the HP Slate, I could see this being a great accessory for a child's room and for educational purposes - not only that they could watch all there favourite films on it. It would also be great if like me you don't have a TV in your room its easy to use and it has everything you need - I am going to miss having my late night films in bed! 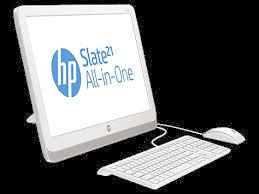 The HP Slate21 All-in-One is available now from the HP Store and UK retail partners, with a starting price of £369. I have been loaned the HP Slate21 for the purpose of this review.